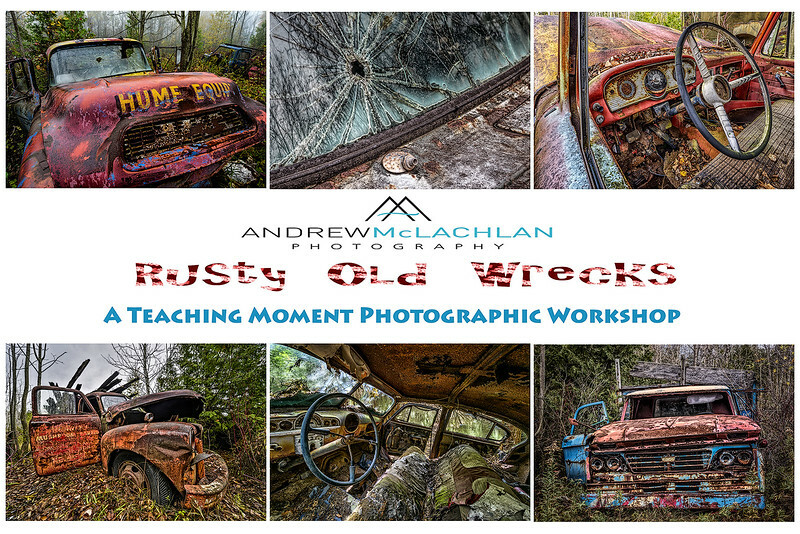 Join me on Saturday November 3, 2018 from 8:00 a.m. to 12:00 p.m. for the Rusty Old Wrecks Photographic Workshop being held at McClean’s Auto Wreckers, near Milton, Ontario. Whether you are relatively new to photography or looking for instruction to fine tune your craft this 4 hour workshop provides excellent subject matter with acres of old dilapidated cars and trucks to chose from. You will learn everything from the basics of good composition, using filters to your advantage, and the benefits of HDR photography. The cost of this workshop is $65 plus HST and must be paid in advance of the workshop date. To reserve your spot and to arrange payment please contacting me by clicking here. The maximum number of participants for this event is 10. This workshop will run rain, shine, or snow. Cancellation Policy: There are no refunds for Teaching Moment Photographic Workshops. If you are unable to attend you will receive credit in the amount paid for a future Teaching Moment Photographic Workshop.